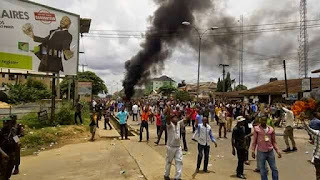 Home Nigerian News Protesters Storms Edo INEC Office Over Electuion Result Announcement. Protesters Storms Edo INEC Office Over Electuion Result Announcement. 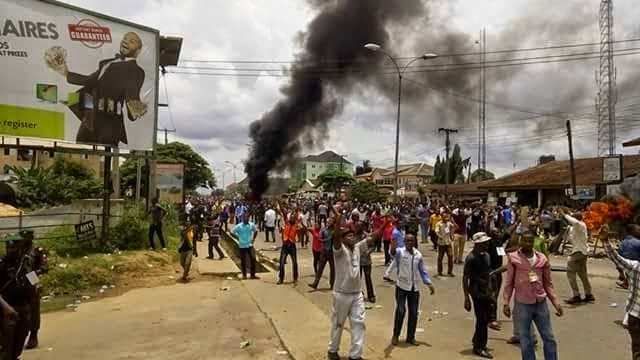 Protests have begun outside the office of the Independent National Electoral Commission (INEC) in Edo State. The protesters said that they are protesting the alleged change of results by the electoral commission. INEC announced results of nine out of 18 Local Government Areas with the All Progressives Congress candidate winning in five while the candidate of the Peoples Democratic Party has scooped the remaining four Local Government Areas. The APC won in Owan West, Egor, Igueben, Uhunwomnde and Oredo local government areas, while the PDP polled more votes in Esan West, Orhiomwon, Esan South-East and Esan North-East local government areas. The protesters said that they are protesting the alleged change of results by the electoral commission. Security officials have formed a barricade outside the INEC office to stall any breakdown of law and order INEC announced results of nine out of 18 Local Government Areas with the All Progressives Congress candidate winning in five while the candidate of the Peoples Democratic Party has scooped the remaining four Local Government Areas.